The Washington Post has run two articles on Small Businesses trying to recover from Hurricane Katrina and looters in the New Orleans Area. Here are two stories WP ran on Frank Sibley, a long time family friend and owner of R. J. Marchand's Contractor Specialties Inc. 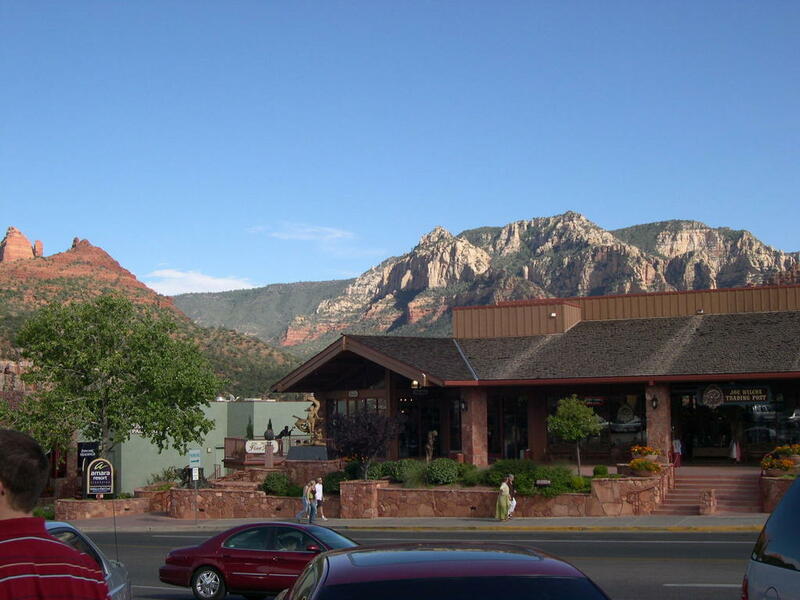 The company was started by my father in 1958 as R. J. Marchand & Company. We are praying for the recovery of people and businesses in the New Orleans and Gulf Coast areas. It's going to be a long haul to get back to home and work for all these people. In 1958, R. J. Marchand & Company started business at 315 Magazine Street in downtown New Orleans, across from the Board of Trade Annex, serving the Construction Industry. At that time, the organization consisted of three office personnel, two salesmen, one truck, and 10,000 square feet of warehouse space with less than 100 items in inventory. A building was purchased in 1960 and the company moved to its new location at 3515 Division Street in Metairie. Rivers J. Marchand retired in 1993 selling the company to his Vice Presidents, Frank Sibley and Leo Liccardi. The new owners divided the company into two separate companies, thus forming R.J. Marchand Contractor Specialties and Marchand Interior Specialties. R.J. Marchand Contractor Specialties employs twenty-two people, operates a fleet of five trucks, maintains over 20,000 square feet of office and warehouse space with over 20,000 items in inventory. Their Sales Organization is highly skilled and factory trained, offering fast and efficient service to their customers. METAIRIE, La. -- Craig Boes walked into a hardware store, approached the owner and confessed. A few days before, he had come through a broken window and swiped a crowbar. METAIRIE, La. -- Greg Sibley rummaged through a cardboard box in the hardware store he runs with his father 10 miles outside of downtown New Orleans, looking for 2,000 metal screws. 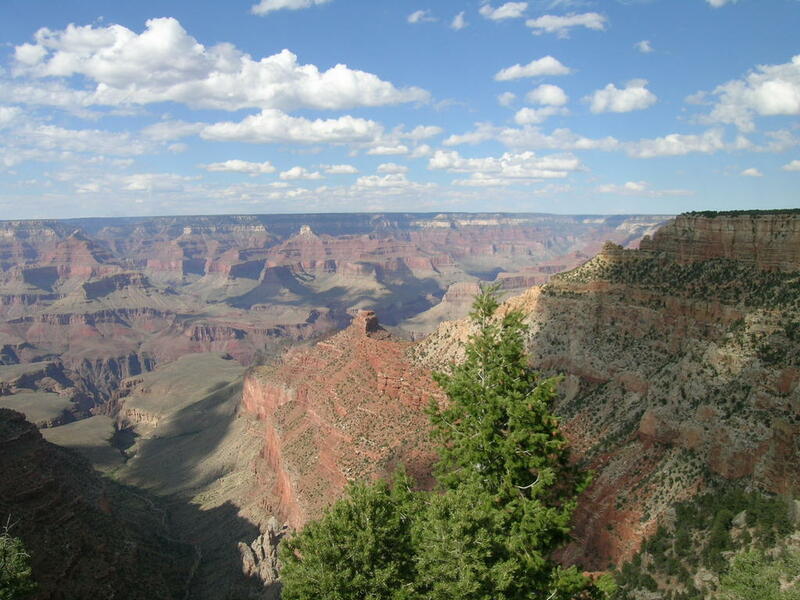 After spending a few days in the gallery, my husband, Steve Foster and I decided we had to go see the Grand Canyon. We drove the convertible mustang (not our rental choice but everyone seems to love it out here). We took the two hour scenic tour through some beautiful landscape; Aspens, Red Hills and then the "big hole" came up quicker than we thought. 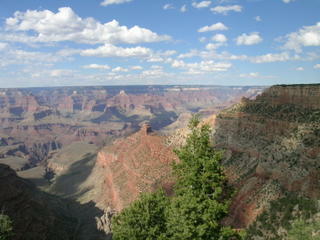 It was well worth the drive for inspiration in color and form in nature. I got a good airing out of the psyche with sun, wind and HEAT! View from the "back door" of the gallery. This is God's land and a glorious one! 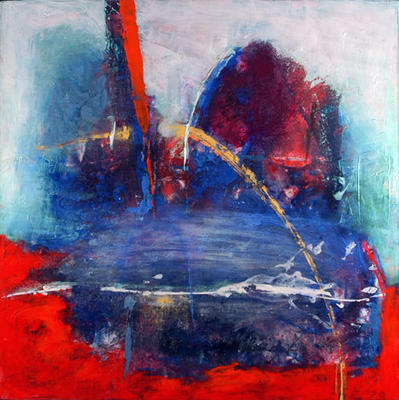 The color, light and forms are a painter's dream. We arrived at the gallery in time to assemble a large dipytch before tomorrow's opening night. Took a quick drive through the landscape after greeting gallery visitors all day. Flying out to Sedona, AZ with my husband today. We plan to visit Joe Wilcox Fine Arts Gallery before the "Ellipsis" exhibition reception on September 24, 2005. Late arrival - so more later. I've been madly printing photos for an "artbook" of paintings which I'm taking to Arizona on Thursday. I'm really busy this week being a mini desk top publisher, a web person and a painter. The first two hats are in the lead as everything will be completed by Wednesday night. There's a lot that goes into doing a solo exhibition. Fortunately for me, I like doing all the other stuff. An assistant would be ideal in these intensely busy times! 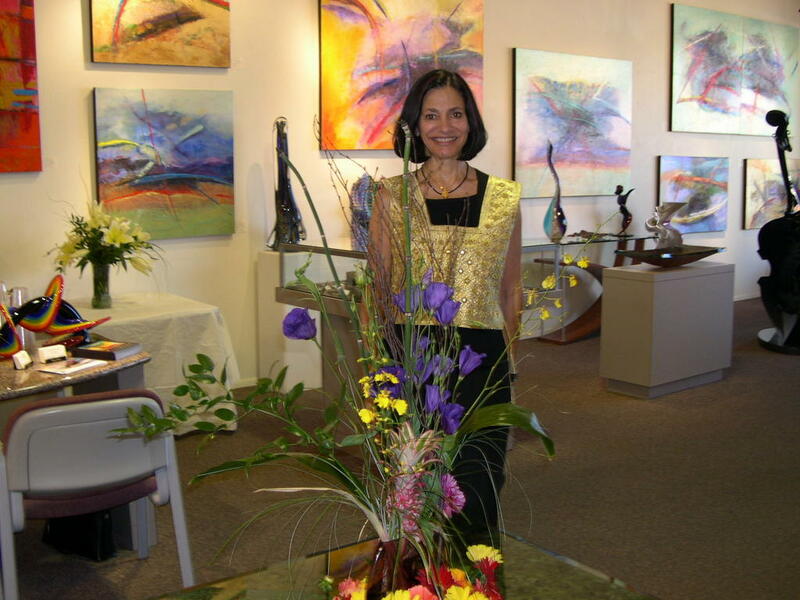 Photos of my paintings are lined up around my floor and I am getting to see a mini preview of the work I have done in the past year.The paintings are already in the Sedona gallery. I'm looking forward to seeing them hanging in a large space. 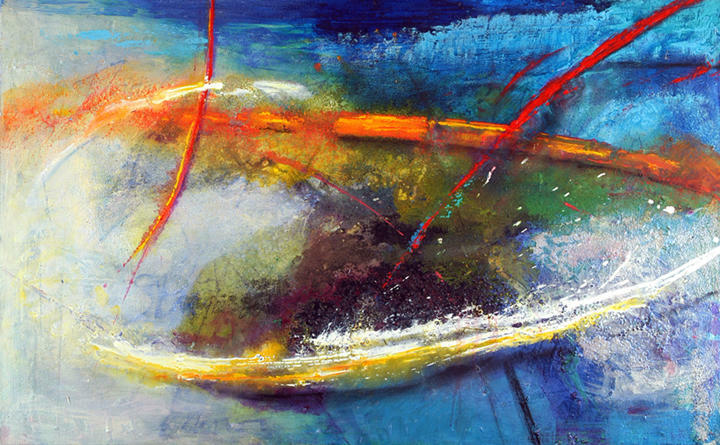 I'm happy with the way color passages and textures are evolving in the work. It's going to be interesting to see the paintings displayed in the crisp desert light of day. There's lots of shows around DC that I'd like to see but they will have to wait until I get back. In the meantime, my studio is calling to me and first things first. 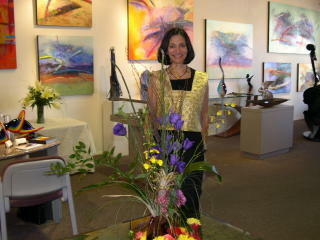 It was a delightful day visiting with some of the participating artists. There was lots of good food and lots of good artists exhibiting their work. Nicolas Shi, Matt Sesow, Dana Ellyn, Chuck Baxter and Stevens Jay Carter were just a few of the highlights. 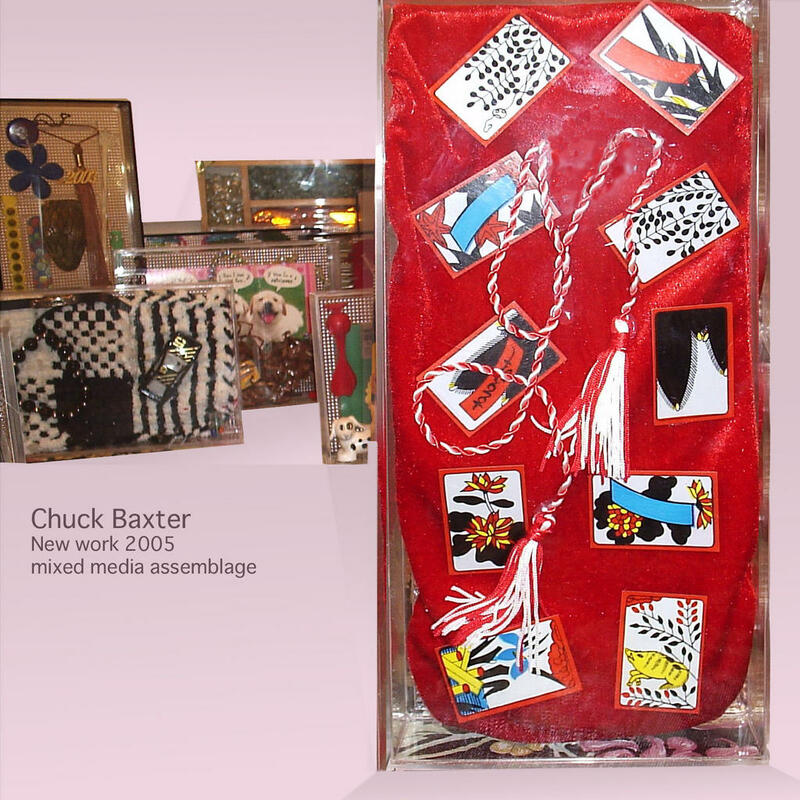 You'll be surprised at the found objects that Chuck Baxter uses to make his art. From street debris, a folksy art is born. Chuck finds new ways to reinvent our throw away society. To see pictures of the artists and event click here. Photo Gallery. Another artist, Alexandra Silverthorne reports on other excellent artists participating in Arts on Foot. Wish I could have visited with more of the artists, "catch ya next time". I spent my day as a participant in the festival at the Zenith Gallery. 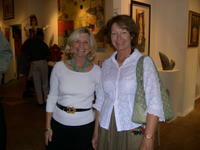 They also enjoyed a large steady stream of Arts on Foot visitors. I was re-introduced to a collector who purchased a piece of mine in the 80's when he was fresh out of college! Tom told me that he has the painting in his home in a place of honor. Does it get any better than this? Reconnecting. 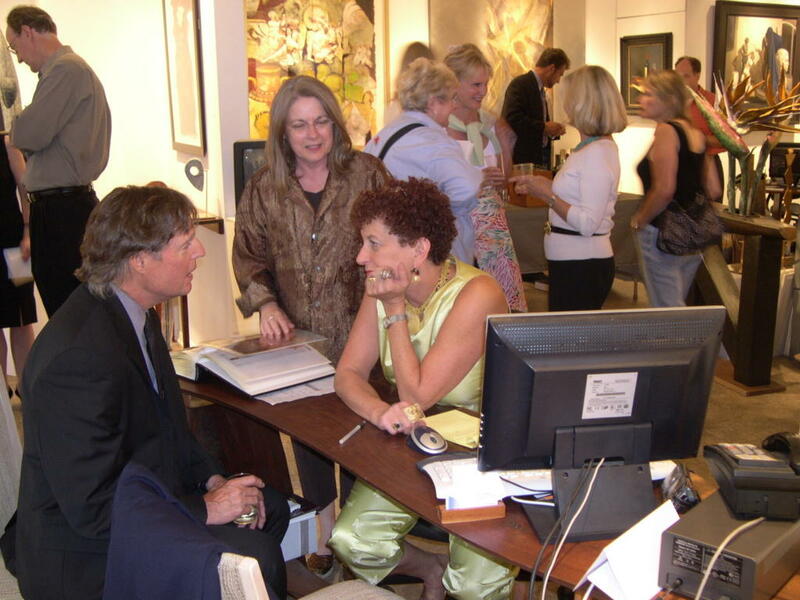 Arts on Foot is coming this Saturday, September 17. with an Art Market: Juried Show. Jurors, including Cate Fraser of Fraser Art Gallery and artist Richard Dana selected over 75 artists to display and sell their works of art –paintings, photographs, drawings, mixed media, sculpture, ceramics — on F Street between 7th and 8th and 8th Street between E and F. Come join the fun on Saturday, September 17, 2005, between 11:00am and 5:00pm, when Downtown Washington's Pennsylvania Quarter will hold its 13th Annual Arts on Foot Festival. Some of my artist friends will be participating in Arts on Foot this Saturday. 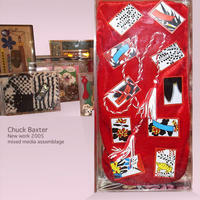 Chuck Baxter is an emerging artist who will be showing 20 of his brand new mixed media works at affordable prices. Come early to see and buy them!! I'll be touring the artists booths first thing to see what's up in DC art! 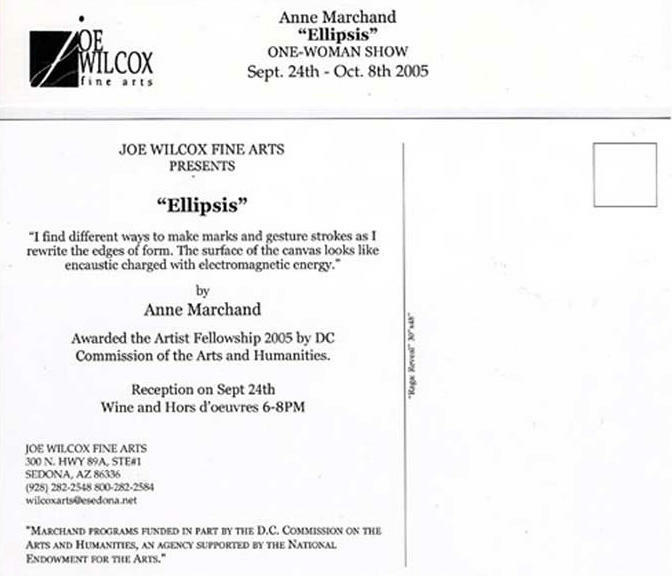 Copyright©2005 Anne Marchand. Photo credit: Greg Staley. 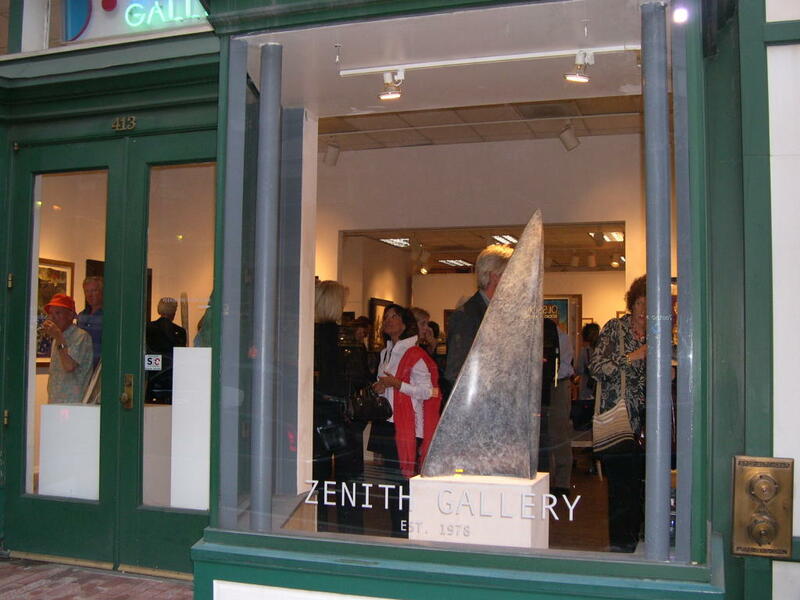 Zenith Gallery is located at 413 7th Street NW (between D and E Streets). Co-sponsors of this year’s Arts on Foot are the Pennsylvania Quarter Neighborhood Association and the Downtown DC BID; Smooth Jazz 105.9 is the event’s on air media partner. 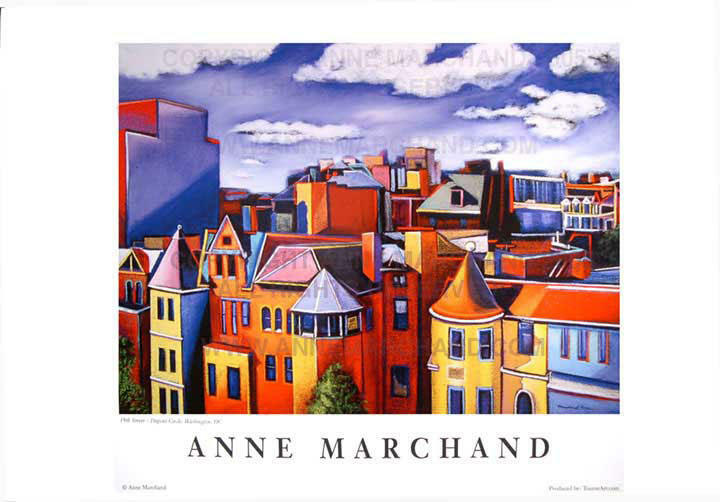 © Anne Marchand. All rights reserved. 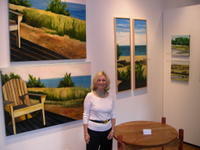 I like many other artists in the DC area want to help with the Hurricane Katrina disaster relief. This Hurricane disaster is personal for me as all my relatives lived in New Orleans and on the North Shore of Lake Ponchartrain. I am one of the lucky ones being able to account for all family members who are scattered along the Gulf Coast coping as best they can. I worry for my two sisters and their families who are staying to rebuild their farm, Taylor's Happy Oaks Farm in Folsom, LA. The centuries old oaks and the food crops have been stripped from their land by Hurricane winds. Their houses are still standing. They are operating on generators with packaged meals and water provided by the Red Cross stations. One gasoline station has managed to reopen in their town and they can get fuel for their generators. It will be a long road to recovery, economical, mental and environmental. My sister says it feels to her like it must have felt living in the Great Depression. They have no power since they are rural and are part of a small coop power source. She thinks they will be last to have service restored. The heat worsens the conditions. This scenario is being played out across the south in different degrees of suffering and stress. I shed my tears for all the suffering souls and I am keeping a positive outlook for the rebuilding of their futures. I want to contribute to the relief effort by offering posters of five my cityscape paintings during the month of September. 100% of my revenue from the sales of these posters will go to families who need help including Taylor's Happy Oaks Farm. The signed posters are available at $25.00 each. If you would like to contribute by purchasing a poster, you can go directly to my website gallery at www.annemarchand.com. Click on Art Prints, then click Posters. You can order secure online. 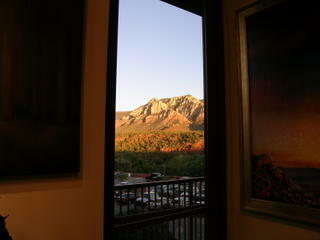 This exhibit is a culmination of three quarters of a year's work for a new gallery venue in Sedona, AZ. I have been inspired by images that I see from Hubble's "eye" and the connections those images trigger, a reflection of the macrocosm in the microcosm. Yesterday, during an ordinary eye exam, I was struck by the beauty of the retina and its optical nerve pathways. Through digital technology, I could see that beauty resembling images from space with color shifts and subtle blendings like wind trails. I am often in awe of the wondrous world in which I find myself. How do you like that! Someone is running around the city using my name and writing articles for the Washington Post Metro Section. I had heard her (my) name mentioned on numerous occasions. I even had to use my full name at the Dentist office in Virginia so our dental records wouldn't collide. She got to keep her name. I did get one of her appointments by mistake which was fine for me. Anyhow, just so you don't mistake me for the other Ann Marchand, she doesn't use an "e" and I do. She writes and I paint. Perhaps we could combine our skills into one easy style and make life simpler for both of us. I've been wanting a clone and maybe this is as close as it gets. Well, the upside is we are both creative souls, artists in different medias. Perhaps, I will come face to face with my "other" one day soon. Maryland Art Place, a special curated exhibition: (un)KONVENTIONAL KITSCH! Maryland Art Place invites Mid-Atlantic artists to participate in a special curated exhibition: (un)KONVENTIONAL KITSCH! Proposals must be postmarked by September 23. This exhibition will explore kitsch in all forms, exploring a range of media, including small objects to room sized installations by significant and rising artists of the region. Participating artists are given free reign to create works: inspired by; limited to; or resistant of; sensibilities normally related to kitsch. For more details and to download an application, please visit Maryland Art Place - (un)KONVENTIONAL KITSCH! Stopped by the Zenith Gallery "Into the Minds of Nine" opening last night. I know most of the exhibiting artists. Gloria Cesal, Joan Konkel, Bradley Stevens and Ellen Sinel were there when I showed up. 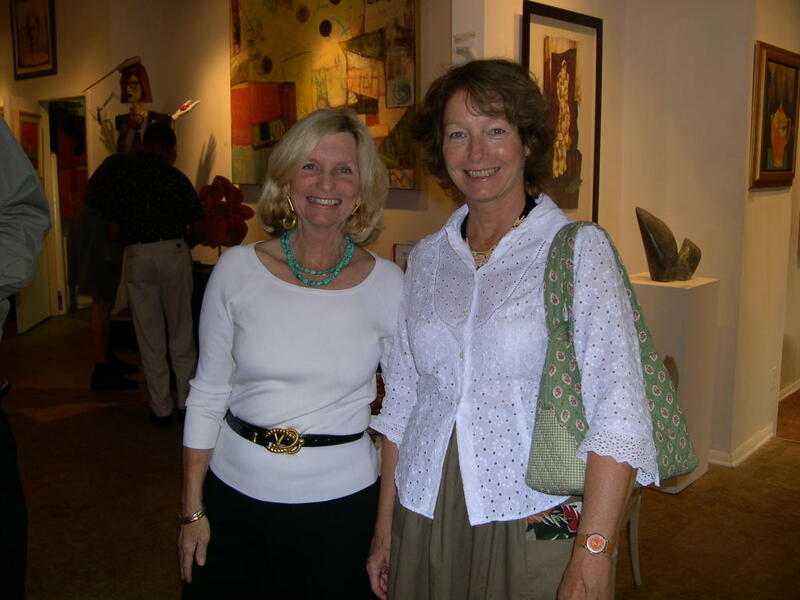 Here's artists Ellen Sinel and Wendy Garner. 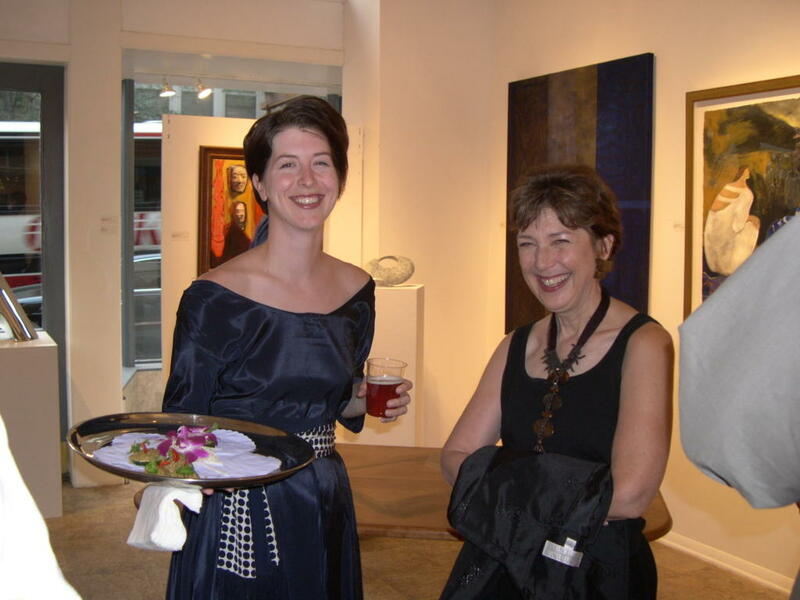 Margery E. Goldberg, Owner & Director talks with a patron at the event. Here are some picks from the opening. Gallery Manager Anne Surak as beautiful as ever with artist Joan Konkel. Ellen Sinel with her superb landscapes. 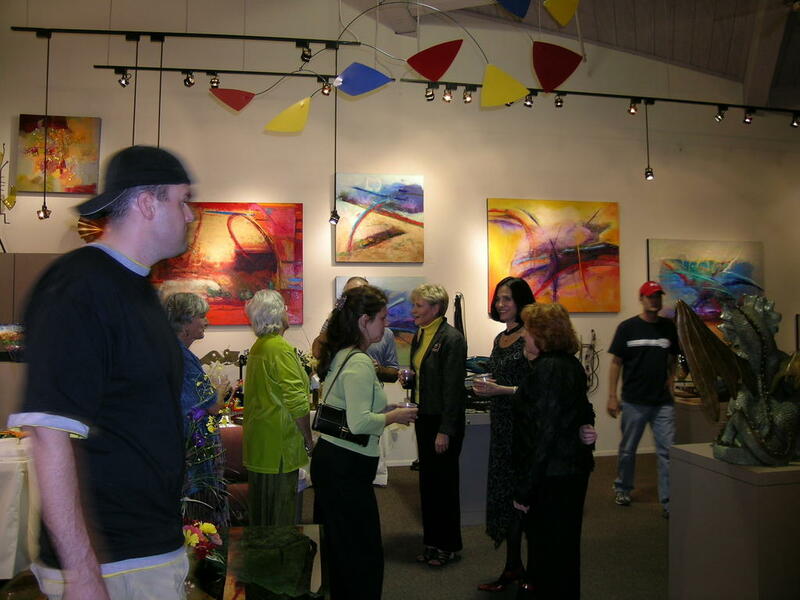 A crowd of gallery visitors. I headed out after 7pm to dine with artist friends at a delicious Indian Vegetarian Restaurant, Nirvana on K Street. We were able to park a block away and walk. The restaurant serves fare from every region of India. Two of the most adventurous of our party, had the Thali Platters served on traditional metal plates. Lots of great food, laughter and art talk capped my night! Here we are, the diners; Leslie, Kiki, Alex and me.